How to change character code in Type1 font? 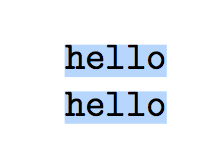 I needed to make spaces at the beginning of line copyable in pdf, and came up with the following trick. This works beautifully, but I wanted to ask if this way is "legal". What becomes with the metrics if pdftex is used directly, and if dvipdfmx is used? I know they take metrics from Type1 fonts, without paying attention to tfm files. What metrics are used in this case? As you see, the PDF file contains the repeated tilde, but the font resource has the modified encoding and so this tilde will appear as something else to the PDF viewer. which shows all spaces are “seen”. No spaces are copied. Therefore, the possibility of copying the spaces depends on the previewer. What's “seen” are spaces, but the underlying text still has tildes. You could also try \pdffakespace and \pdfinterwordspaceon. But while in the following example the "f"'s copy fine from the pdf, spaces are sometimes missing, or there is only one instead of many, 00A0 is copied as 0020 -- I don't think that TeX is removing them, it also happens with boxes between the spaces. So imho the pdf viewer is trying to be to intelligent. Not the answer you're looking for? Browse other questions tagged plain-tex or ask your own question. Scope of catcode change for escape character ? How do I change font in pgfplots with plain XeTeX? How to print a row of points (or any other character) in plain TeX? Where is it allowed to change \hsize? In traditional TeX how to change size of \footnote font?